This year's CPAC ended yesterday and, as always, I did get a hearty chuckle out of listening to this conservative block party's speakers beat a dead horse. You have to remember, those who attend are the diehards, those who wear the blinders, and those who have surrounded themselves with a bubble of denial. They go to chew on the red meat thrown to them by the likes of Ted Cruz and Sarah Palin, not the slowly awakening awareness of Paul Ryan. They don't understand Ted Cruz thinks the whole country is like Florida and by playing 'Stand your ground' he's going to go far. He isn't, but that's beyond their ken. They let that haus frau Sarah Palin, with her early 60's dated look, take the stage and ride another dead horse, Obamacare, even further into the ground. 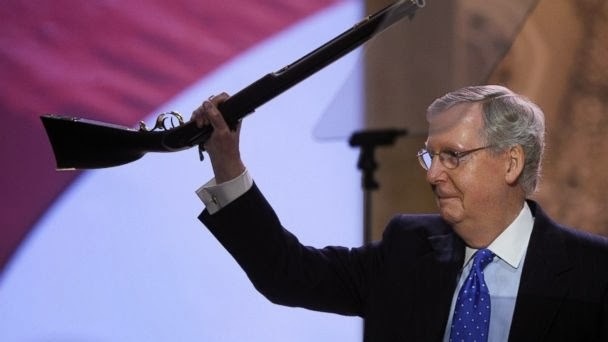 Mitch McConnell took the stage brandishing a rifle. A coonskin hat would have completed the parody, of course that's something the party loyalists will never understand. Every year CPAC holds a straw poll to vote for the most conservative, most Republican man they would like to see as president. Notice I say man, not individual. No woman has ever won. Now tell me that doesn't sound sexist. Anyway, this year Rand Paul won. He won the straw poll last year, too. If he wins it one more year you could say he's on a hot streak. This is not a good thing for Rand. Romney won it four times and failed in his bid for the presidency. Rand's own father, Ron, won the same poll three times and his failed campaigns were pretty much the stuff jokes are made of. If Rand does run, he will have to deal with the fact there are a lot of people out there who think of him as a word thief, thanks to his exploits in plagiarism. Every word he speaks or puts out in print is going to be checked over and over again. Most people in this country have a problem with those who steal. Paul Ryan was the one voice which seemed to make any sense what so ever, of course he's been through the presidential campaign grind and is well aware of all the mistakes which were made. He talks about a more inclusive umbrella in which the party diversifies it's constituents. He's on the right track. Of course, he was playing to the wrong crowd. All this group wanted to do was gnaw on their bones of hate. They are killing the GOP.